Stacy Juba's book Offsides (Hockey Rivals Book 2) was available from LibraryThing Member Giveaway. Stacy Juba's book Prancing Around With Sleeping Beauty (Storybook Valley #2) was available from LibraryThing Member Giveaway. Stacy Juba's book Teddy Bear Town Children's E-Book Bundle was available from LibraryThing Member Giveaway. Stacy Juba's book Face-Off was available from LibraryThing Member Giveaway. Stacy Juba's book Dark Before Dawn was available from LibraryThing Member Giveaway. Stacy Juba's book Twenty-Five Years Ago Today was available from LibraryThing Member Giveaway. Stacy Juba's book The Flag Keeper was available from LibraryThing Member Giveaway. 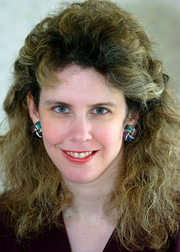 Stacy Juba is currently considered a "single author." If one or more works are by a distinct, homonymous authors, go ahead and split the author. Stacy Juba is composed of 3 names. You can examine and separate out names.